TWO (2) complete data sets per month, including master calibration frames, delivered via direct download link. Images will be selected through a monthly survey that will be made available online to all paying subscribers of a system. 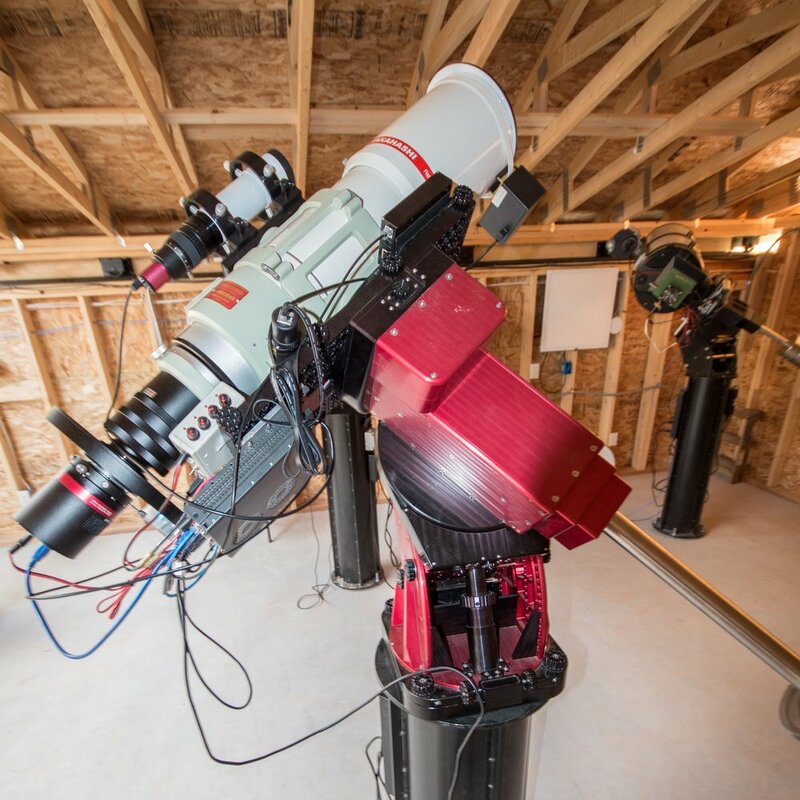 Monthly subscribers have the option to add a third object of their choosing for an extra $75 donation to the Grand Mesa Observatory. This will be in the form of a custom data set, and as such it can be any object our gear is currently able to target. Total exposure times and delivery schedules will be subject to different timetables than the subscription data. Contact Us for more information. Minimum of 12 sub-exposures @ 5min each and $2.50 per frame. Master Calibration files will be included. Please complete the “CUSTOM DATA REQUEST” page for for specific pricing, policies, and for the actual request form itself. For any previously captured data, complete sets can be purchased for $75. This includes the light frames as well as all calibration files, but no changes, updates, or additions may be requested. Please CONTACT US for more information, or for inquiries about available data. Since subscription services are being offered to maximize the availability of each available imaging system, targets will be selected democratically through an online poll. This will be conducted using Google polls, and at the beginning of each month a link will be made available on the system-specific web pages right here at www.grandmesaobservatory.com. Each subscription login page will be password protected, and you will find both the monthly poll and the previous month’s data available to download for all subscribers of a particular system. No Google account is required to partake in this poll, just internet access and a working email address. Each system’s monthly poll will contain 6-10 targets that have been pre-selected by GMO staff for compatibility with each respective system. Subscribers may then select their top 3 choices from the available options, with the 3 highest ranked objects being selected as the final targets for the following month. Selections must be made before the 20th of the month in order to be counted, and those who miss this deadline will have to accept the group’s selection. Subscribers will receive access to their system’s monthly data through an online download link which will also be provided on their system-specific login pages. Once a target has been selected it will not be available on that particular system for one year. Depending on the system the list of potential targets will include a mix of broadband and narrowband options. The poll will indicate what type of data is being acquired, but GMO staff recommend that subscribers try to vote for an even mix of broadband and narrowband targets. The selected targets will be imaged over the course of the following month, with data being made available as it is completed. Subscribers will be advised of the final monthly selections before the data is acquired, and should the weather conditions prevent us from capturing selected data then subscribers will be credited for the following month. Any cancellations for subscription services must be made before the first of the month as well, and refunds will not be given for cancellations made after that time. Subscription login pages are updated with the target selection poll for February on January 1st. Subscribers have until January 20th to complete the poll. Final selections announced some time between January 20th to the 31st. Imaging begins on selected targets February 1st, and all data from the January poll will be available by February 28th. Data sets for each target will include no less than 4hr of light frame data but the final amount will be at the discretion of Grand Mesa Observatory staff. In addition to total exposure time, GMO staff reserves the right to decide exactly how much data is acquired for each filter (where applicable), but calculations will be made to maximize the effectiveness of a system for any objects selected. All data sets will include the raw files for each channel, the pre-calibrated raw files ready for stacking, and the pre-stacked master files ready for combination. In addition, master calibration files for each particular system will be available in their own folders, and will include all of the individual calibration frames as well as master dark, master bias, and master flat files. All downloads can be found on the system-specific login pages.